The Hastings movable bridge, located in the Village of Hastings, Ontario, Canada, needed major repairs. The structure is a 2,200 square foot (204 square meter) swing bridge. In 2016, Canam-Bridges replaced its 83.8 foot (25.6 meters) long by 26.7 foot (8.2 meters) wide superstructure. The weight of the new bridge superstructure and deck had to be low enough for the existing mechanical and electrical elements in the substructure to support its movement. Demolition and reconstruction of the bridge had to be completed quickly as its reconstruction split the Village of Hastings in half during construction. Associated Engineering, along with Canam-Bridge’s early involvement, chose an orthotropic steel deck (OSD) solution due to its light weight; a very competitive option for movable spans when compared to conventional deck systems.. The Canadian Highway Bridge Design Code CAN/CSA S6-14 requests that a solid deck of lightweight construction in movable spans be considered in order to improve traction, reduce noise and protect the infrastructure of mobile bridges. Canam-Bridges’ orthotropic steel deck is shop-fabricated under a rigorous quality-assurance and quality control program, offering a service life well beyond 75 years… With easily defined geometry, an orthotropic steel deck can offer increased moments of inertia, more effectively and efficiently controlling deflections. OSD also allows the contractor to apply a thin antiskid (and asphalt if desired) wearing surface, allowing for an even quicker installation on the jobsite. A feature of the replacement of the Hastings swing bridge’s superstructure was that the design and optimization of the OSD was the contractor’s responsibility. The engineer made sure that the OSD was designed in accordance with the latest standards and that it respected the maximum weight imposed by the specifications of the contract. For this project, Canam-Bridges was responsible for optimizing the orthotropic steel deck, the fabrication and supply of the OSD and the new superstructure, shipping logistics, and the on-site erection. The owner requested an asphalt wearing surface, so a longitudinal bolted joint was used with countersunk bolts to fasten the deck sections. The use of an orthotropic steel deck for this new short movable span was a success. 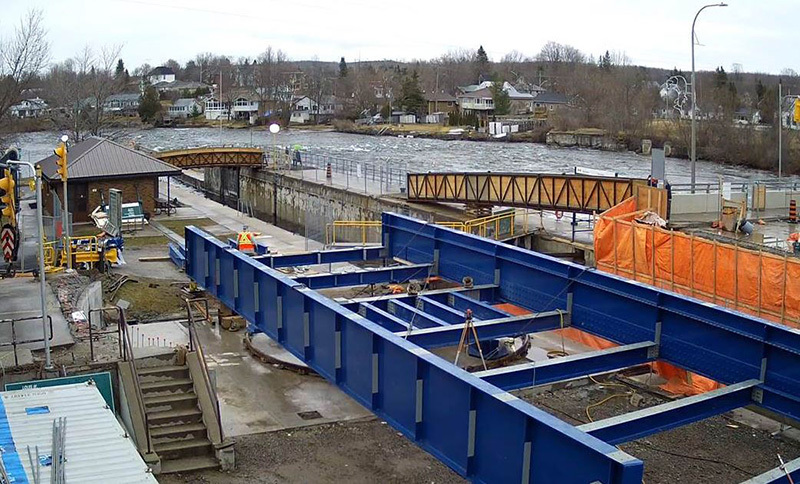 As Canam-Bridges was responsible for both the final design and the supply of the deck structure, the optimization of the design was performed considering three major criteria: self-weight, ease of fabrication in the plant and quick installation at the jobsite. For any questions regarding this article, contact us. 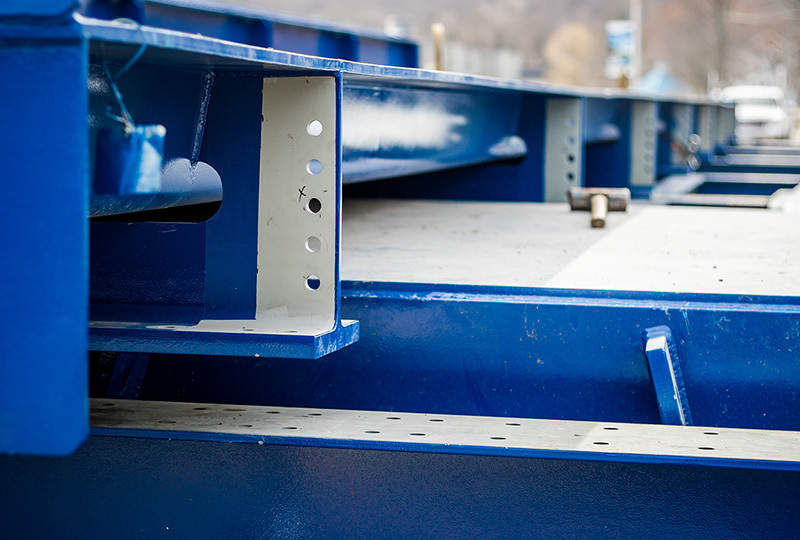 Watch our videoclips and learn more about the fabrication of steel box girders for the new Champlain Bridge.